Remember this guy that looked so very sad? Well, now he’s had a makeover and he’s ready to strut his stuff. Take a look! That’s right – I painted the piping! 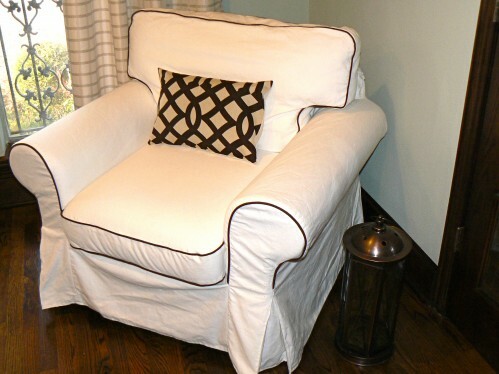 * Note: I used fabric paint because I wanted to be able to wash my slipcovers without washing away my hard work. 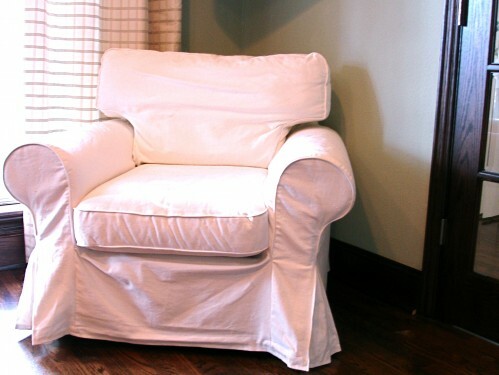 If you’re painting upholstered pieces that don’t have removable covers, you could probably just use regular craft paint to achieve the same result, but without the washability factor. 2. Set up shop. Although this project is cheap and easy, it is pretty time-consuming. Plan on spending at least a few evenings in front of the TV working on painting your piping. Maybe more than a few evenings if you’re like me and get distracted easily! 3. Paint away. 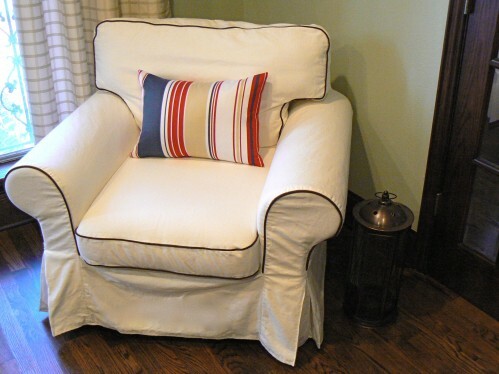 I thought the easiest way to tackle the piping was to leave the slipcover on the cushions and chair frame – this kept the slipcover from being too floppy and hard to work with. For the cushions, I just hauled them over to the couch, but for the chair frame I sat on the floor in front of it and painted away. 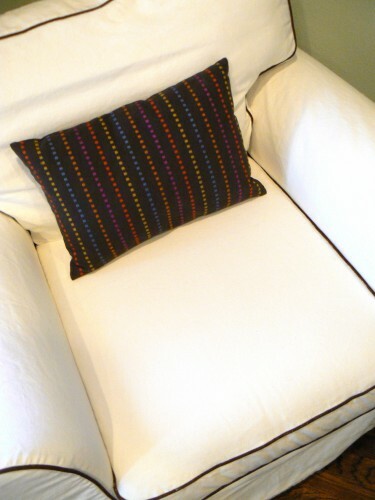 As for technique, this is where your strips of cardboard come into play – I wedged the cardboard between the piping and the cushion fabric so that the cardboard formed a barrier – this let me paint somewhat sloppily without worrying about getting the paint onto the fabric of the cushion. That’s it! I’m really happy with how this project turned out – this is a chair that I’ve had for 7 years that has never really worked in any of my rooms, but now I feel like it could work anywhere! The new chocolate brown and off-white color scheme meshes with every room in our house, and it also works with all of our fun pillows and accessories – I could see playing musical rooms with this guy as we switch up furniture arrangements throughout the house. How about you guys – would you ever consider pimping your piping? P.S. Thanks to everyone that has already played along and filled out the 2010 IGTBH Online Survey! I plan on leaving it up until Wednesday and then tabulating the results and hopefully posting them before the end of the week. Click here if you want to put in your 2 cents while you still can! P.P.S. Today is my birthday!! This is the last year before I turn the big 3-0, and I’m excited to see what lies ahead in this last year of my 20s. And thanks for all of the birthday wishes I’ve already received, you guys have put a big smile on my face! This post is shared with A Soft Place to Land, Reinvented, Between Naps on the Porch, It’s So Very Cheri, The Girl Creative, and The DIY Show Off. Pimped piping with fabric paint ? Well if that isn’t the most genius solution on the planet !! What a fantastic idea. It looks so much nicer. I may have to try this myself. What a great idea!! 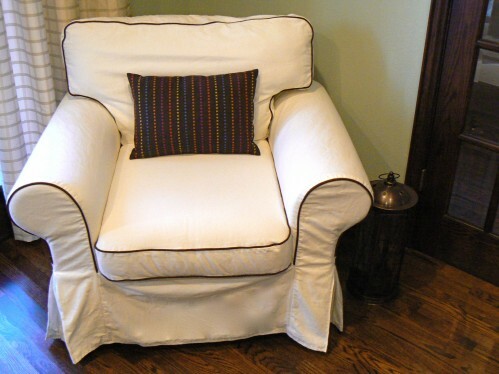 At 1st I was thinking new slipcover…can’t believe you painted it – looks so much fresher – way to go. 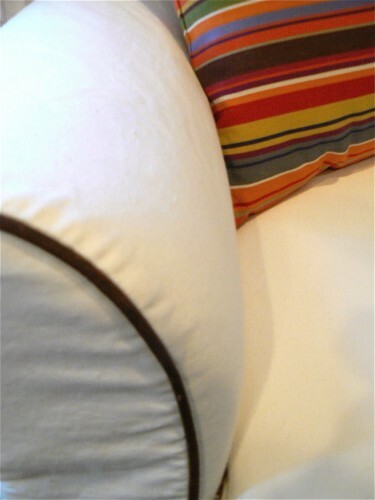 .-= Katrina´s last blog post ..Saturday Morning Thrifty (2) =-. I am super impressed and shocked that that is PAINT! I thought you must have re-piped the chair when I first saw the picture. How crafty and creative of you! 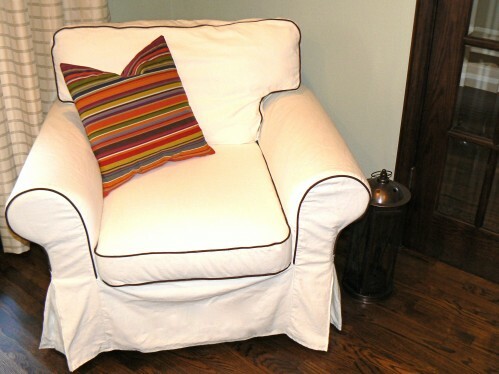 It looks gorgeous, and all those throw pillows work so well with it – go Liz! Hope your birthday is smashing! Happy birthday to you!!! That’s an amazing idea. I never would have thought of it. .-= Irene R´s last blog post ..DIY Really Done – Kitchen Island =-. Amazing! What a brilliant idea! It looks awesome! I love the homemade pizza post too. Thanks for the tips! We’ve been wanting to give it a try ever since Mr. DIY got a pizza stone for his Big Green Egg so I can’t wait to try your ingredients! Sounds delicious! Happy Birthday again, birthday twin (I’m staying 39 too, okay?!)! :) Celebrate all week! .-= Roeshel´s last blog post ..DIY Project Parade =-. Wow, this looks great Liz! I have the exact same chair and I think some gray piping would definitely perk her right up. .-= Averill´s last blog post ..It’s a beautiful day… =-. That is a fantastic idea…how smart are you! Thanks for sharing! .-= Heather´s last blog post ..Burner Cover Chickie Sign =-. You painted it? I never would’ve thought of that. And I’m amazed by what a difference that made. Looks really sharp! That’s amazing! I love a contrasting piping, and yours looks phenomenal! I never would have known it was painted just by looking at it. .-= Kristi @ Addicted 2 Decorating´s last blog post ..Eating Area Progress: Window Treatment and New Wall Color =-. Wonderful! I never would have guessed that it was painted! It really is a lovely detail! .-= Meredith´s last blog post ..DIY to Do =-. OM this is amazing!!! seriously!! .-= rene@bargainhoot´s last blog post ..Don’t forget to sign up for the Emerson $50.00 Gift cert. giveaway =-. Hey there! I think it’s holding up pretty well. I’ve gone through several washings and there is a little bit of fading, but I thought it was an acceptable amount. It should be great for your toddler’s room!